Get Out in the Snow - Even if you're not a skier or boarder, there are plenty of other ways to get out in the snow. Vermont's cross-country skiing centers offer a wide range of peaceful escapes from groomed trails over open meadows to sheltered tracks through whispering pines. Or, you can leave it all behind on a pair of lightweight snowshoes and head out into the back country. Try Sledding Again - It's not just for kids anymore. There are a number of sledding parks, many at winter resorts, that bring out the kid in all of us. Grab a snow tube and get going. Go Ice Skating - Many Vermont towns and villages have a community skating rink. Your innkeeper might also be able to suggest a park or pond that the locals use for skating. You say you don't have skates - most rinks offer rentals. Take a Sleigh Ride - Many inns and farms offer traditional horse-drawn sleigh rides, some with jingle bells! Ride a Snowmobile - If you've never tried it, snowmobiling is easy, comfortable and surprisingly addictive. 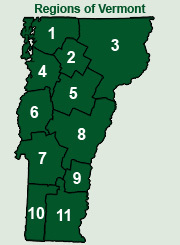 The Vermont Association of Snow Travelers (VAST) maintain over 5,000 miles of well-marked trails. Some winter resorts offer guided rides to get you started. Hit the Spa - If your idea of relaxation has nothing to do with speeding down a mountain side, slow things down with a luxurious day at the spa. Throughout the state, dozens of inns and resorts feature full service spas and fitness centers. Go Dog Sledding - The sight (and sound) of 16-dog teams racing over a frozen lake is hard to match. Arrange a dogsled ride for yourself. What an adventure! See Where It's Made - Instead of killing time in the base lodge, see how Vermonters make world-class ice cream, furniture, teddy bears, blown glass, cheese, chocolate, pewter and much much more. Check with your innkeeper to learn whatï¿½s in your area or check the Shopping page. Catch a Concert - From jazz to folk to classical, Vermont's music scene is busy and eclectic. Check the Calendar of Events for listings. Track a Moose - Walking in the woods after a fresh snow can yield countless discoveries. Explore Vermont Breweries and Wineries - Vermont is home to dozens of craft breweries with some of the larger ones offering tours. In addition, Vermont wineries produce some unique and wonderful wines. Check out tastings from local wineries. Visit a (Little) City - From Burlington to Brattleboro, Bennington to St. Johnsbury, Vermont's cities are the way cities used to be -- small, friendly and often quirky. Visit a Sugarhouse - In late winter or early spring, the sap starts running and the sweet smell of maple fills the air. Check out a nearby sugarhouse to see the magic. Perhaps plan to take in Maple Open House in March. And don't forget to take some syrup home! Browse for Antiques or Art - With so many shops and galleries, the selection of antiques and fine art is vast. And the prices may be better than you'll find at home. Try Ice Fishing - Find out why all those structures pop up on Vermont's ice-covered waters. Check Guided Tours for fishing guides. Walk a Covered Bridge - Vermont is home to over 100 covered bridges. Ride a Fat Bike - Fat bikes have special "fat" tires for riding in the snow. Rent a fat bike and give it a try for a real adventure. Visit a Museum - Vermont has a long an fascinating history. Explore everything from quarryiing marble to early industry to Vermont's Revolutionary history. Whatever your interest, there's probably a museum dedicated to that. Go Shopping - Opportunities abound. Explore everything from a local general store to speciality shops offering Vermont-made goods to name-brand outlets. For more information, check the Shopping page. Dine Out - Vermont has embraced the farm-to-table movement and boasts some wonderful dining experiences. You will find everything from small, intimate cafes to traditional resort restaurants to unique gastro pubs. Bon appetite. Take in a Movie - Whether you're looking for current films or classic cinema, Vermont movie theaters can entertain you. Some even offer live performances and dining. Calendar of Events - There are many activities going on throughout the state all the time. Check our Calendar of Events to see what's happening! Love biking, love winter? You have to try fat bikes!